Understanding Republics and Republicanism: What is a Republic? Likewise, a “republican” is one who is for this style of government (and the term “republicanism” has the same implications). Beyond that, things get complex. The reason things get complex is because the term Republic means a few different things depending on context. That is, it means different things if we are talking about the philosophy of republics, republicanism as an ideology, a Republican party of a given nation, or Republics in-action (which often aren’t actually philosophically republican). We explain Republics from all these frames of references below. With that in mind, lets start with a broad realist definition. TIP: According to the CIA World Fact Book. Republic – a representative democracy in which the people’s elected deputies (representatives), not the people themselves, vote on legislation. Federal republic – a state in which the powers of the central government are restricted and in which the component parts (states, colonies, or provinces) retain a degree of self-government; ultimate sovereign power rests with the voters who chose their governmental representatives. As we can see, our general theory is on track. Below we discuss the complexities that arise from these simple truths. Any state with some semblance of a separation of powers, some form of constitution and law, and generally with some form of representative government (or, any state where the supreme power is in the hands of “the many”; despite its exact mix of governmental forms and attributes). Another way to phrase this is to denote sovereignty (where power originates, not who it is delegated to). From this slightly more idealist perspective, a state is either “a state for the many sovereign people; generally with power delegated to the few” (Republic), or “a state by one absolute sovereign; generally with power delegated to the few” (a Monarchy or “Principality”). Thus, even if the actors are the same (the few), the distinction of where sovereignty rests in the two forms could not be more different. That means, in the purely empirical sense, every real government is either a type of monarchy or a type of republic (see the CIA’s very realist list), like the realist founder of modern political theory Machiavelli said. The problem with the definition of republics above is that it denotes little more than “not officially a monarchy,” and thus leaves the door open for all sorts complications (like the classification of despotic “Republics” who claim their people are sovereign and their state democratic, yet appear to be purely despotic to the outside word). In other words, only having two options for classifying states creates problems. For example it allows states to call themselves “Republics,” even if they meet none of the philosophical criteria. Meanwhile, the definition excludes constitutional monarchies (which are often monarchies with a republican government; such as the U.K. which has a representative parliament). With this in mind, we can expand on Machiavelli’s theory from his Prince and look to Plato’s five regimes from his aptly named Republic, to Aristotle’s more realist theory from his Politics, to Montesquieu’s theory from his Spirit of the Laws, to real classifications used by entities like the CIA to denote differences. – Montesquieu’s Spirit of the Laws 1748, Revolutionary America’s most cited author denoting the difference between a despotic state (that doesn’t rule in-line with the law) and lawful Republics (indirect rule by People) and Monarchies (rule by Prince). FACT: In his Spirit of the Laws Montesquieu considers not only Republics, Monarchies, and Despotic governments but Direct Democracy, Democratic Republics, and even confederations (he even says that “it is difficult for the united states to be all of equal power and extent [in a confederate Republic].”) Consider he wrote this before the United States was called by that name and was still a colony (of the Commonwealth Realm). Madison, who was the primary author of the U.S. Constitution, was well versed in Montesquieu (as were the other founders). It is very likely the founder’s understanding of the term Republic was drawn from thinkers like Machiavelli and Montesquieu. NOTE: Notice Montesquieu eludes that even a fully democratic government (“in which the body..is possessed of the supreme power”). This clues us in that when the term republic was used in the past, it did not disclude a purely democratic republic. TIP: Speaking of realism, Hobbes considered there only to be three states, the one (Monarchy), the few (Aristocracy; therefore a Republic), and the many (Democracy). He thought tyranny (despotic Monarchy), oligarchy (Aristocracy of wealth), and anarchy (corrupt Democracy) were words we used to describe things we didn’t like. Learn more about the other government types, we’ll cover them more below. As wise as those great thinkers were, their theories are of philosophy, and we want to a solid realist definition of a foundation. With that in mind, instead of considering the inferences of the philosophers (right or wrong), we can get around the complications by using a number of descriptors to denote different “attributes of government” (using realist and idealist factors to better describe if a state is Republican or not, describing its empirical features and its “spirit”). So, we can say things like, “the U.K. is a parliamentary constitutional monarchy (a Commonwealth realm with a Republican and Democratic spirit)”, and “the U.S. is constitutional federal republic (with a Republican and Democratic spirit)”. That helps us to bridge the gap between broad realism and specifics while respecting the often idealistic history of philosophy. The concept of Republics is one of the cornerstones of philosophy, from Plato, to Cicero, to Machiavelli, to Locke, to the founding fathers. Said simply, from an idealist perspective, the term Republic is a badge of hard-won honor, and it is therefore kind of is insulting to call just any old state “a republic” unless it meets a few tests of classical republicanism. With that in mind, let’s now turn to classical republicanism and the philosophy of republics. TIP: “Large” Republics may have more than one Republic within them (ex. Federalism in the United States Republic in which 50 Republican States are in a Union under one Republican Federal Government), meanwhile “small” Republics may be a single state (ex. the Republic of California). TIP: The Republican party was named after their Republican spirit, but the reality is both American parties are philosophically democratic and republican (and liberal, and federalist, etc). See the original namesakes of the parties. Suffice to say we are talking about the principle upon which the party is named, not the party. With the introduction and realist Republics covered, lets focus on classical republicanism and republics as a philosophical concept at the heart of all political philosophy. In the philosophical sense, a Republic is a lawful, constitutional, and sovereign state (or collective of states) in which a sovereign people consent (via a mix of direct and advisory voting) to delegate power to representatives to govern via a mixed government with a separation of powers in order to rule in line with the General Will – PEROID. A Republic is lawful, in that all sovereign within the state are bound by a just social contract. The people (all free citizens of the state) are sovereign, because everyone is equal in their natural rights and liberties. That sovereign power of the people is inalienable, it cannot be traded, only delegated temporarily for the limit of a term. Power is delegated to representatives (via some form of representative democracy or aristocracy), by the sovereign people (all free citizens), in order to execute the General Will of the people, within the bounds of the social contract, which is itself checked democratically by consent, because the purpose of government is to act on behalf of the will of the people (having everyone act at once would be chaotic and not effective, especially in a large Republic). A Republic is generally any state that has a mixed popular government (a polity). Powers are separated (separation of powers) to avoid any on governmental entity within the state having too much power. Fair elections are held to offer consent (even if only advisory for some positions; and even if those positions appoint other positions). This generally involves term limits for most positions. A government has no power without consent, is not legitimate without the rule of law, and is not legitimate if the governors aren’t bound by the law, but is assumed legitimate until the people say otherwise via the electoral process (if the people vote, that is consent, if they can vote and don’t, silence is consent; this is why fair elections are the lifeblood of Republicanism). Republics do not have Princes, Republics are generally meant to avoid tyranny and despotism, and Republics generally champion enlightenment values like the use of reason and logic. If and when a governmental power within the state is not acting in accordance with the law (if it is acting upon a specific, corporate will, or majority will, and not the general will, to the extent action is not lawful or in the general interest), the people then have a right to action to remedy this (they can withdraw the power delegated to the representative). This should be done via voting, via organizing democratically, via debate, via non-violent protest, and by all other peaceful and democratic measures. However; if all else fails, republicans have a right to resist tyranny by any means to secure the state (as long as they themselves avoid tyranny; meaning, they must act within the bounds of just law, or they themselves would be tyrants). See Locke and Rousseau for the theory; but see the Reign of Terror in the French Revolution for what not to do. In these terms, we can understand a Republic as an enlightened form of popular government that mixes Plato’s classical forms of government to maximize the virtues and prevent the vices of either. Since the whole point is lawful representation that avoids tyranny and corruption, a corrupt and despotic government that doesn’t represent its people… is not Republican. This is just basic logic. A Republic led by a true tyrant, is not a true Republic. A Republic that is despotic, is not a true Republic. Republic isn’t a mantle that one owns once they take it, it is an honor earned minute-to-minute by a state via its structure in-action today at this moment. If we understand history’s most important philosophers, we are left with little room to understand the concept of a Republic any other way than the way they did (which doesn’t actually change much author to author unless one strays to Hobbes, Marx, Mussolini or another outlier… although they are all critics of the Republic, not its champions of it). When we consider Athens, Sparta, or Rome to be Republican, and when we consider the Constitution of America promises a Republican form of government, it is even harder to justify straying too far from a philosophical definition of Republics. If we aren’t fighting for a liberal form of republican democracy (a republic) against tyranny, what are we fighting for? It may appear similar to the realist version, but it carries with it another sort of weight that spans centuries and the blood, sweat, and tears of the greatest minds to have ever lived, and in that respect it deserves more attention than many other words we use to describe things. My take is that it is a vast insult to history to act like there is another kind of Republic other than one that at least adheres to the principles of classical Republicanism, but hey, I get that in the modern and broad sense we consider “any country that isn’t a monarchy to be a Republic”… and as I noted, that is no different than what Machiavelli’s realist Prince claims (although his Livy clearly denotes the classical forms and discusses other attributes and properties of governments). See Republicanism as a broad term. TIP: See Montesquieu’s Spirit of the Laws for more on Republics, Despots, and the Separation of powers. 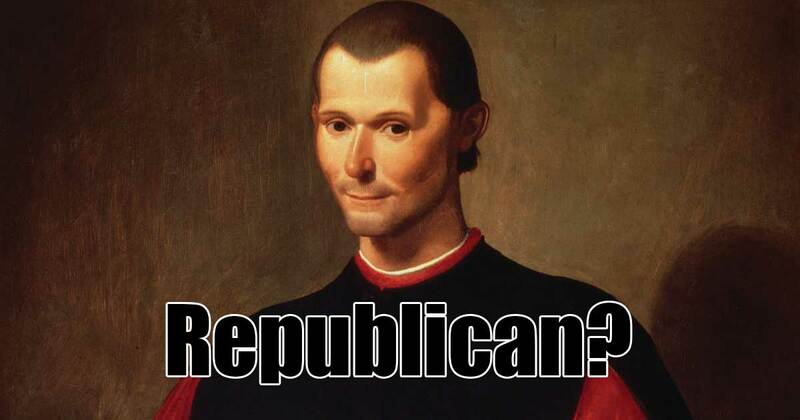 TIP: A Republican is one who believes in the philosophical version of Republics. There is a range of ideologies that fit within this sphere, more on that below. With the above distinction in mind, below we discuss the concept of a republics in both the realist and idealist sense. This will include discussing the term Republic as a synonym for a state (generally a lawful container which holds a popular representative mixed-government that isn’t an absolutist Monarchy), and also discussing “Republic” as a philosophical concept (where it is a lawful popular government that mixes the classical forms of government to protect against tyranny, typically embracing a separation of powers and rule by representatives via consent; AKA a type of enlightened representative democracy rooted in a wise, just, and lawful Aristocracy; as it is described by Plato, Aristotle, Machiavelli, Locke, Rousseau and countless others). TIP: A Republican is one who believes in the philosophy behind creating mixed, lawful, popular governments. Most Americans and westerners are “small r republicans” in this sense. TIP: Not every state that calls itself a Republic is one… to say the least. What a government is and what it calls itself are two different things. Philosophically speaking, a state is only republican if it acts republican. Classically speaking, the term Republic denotes “a mixed government” (a mix of the lawful classical forms, including Democracy and Aristocracy). When a government mixes forms, we can call it “a mixed Republic.” Another term for this is Polity. That label is somewhat tautological, because a mix of the classical form of government is a feature of what it means to be a Republic in the classical sense, but certainly with everything considered, it is worth discussing. In the classical sense (in terms of Plato’s Five Regimes), the term Republic denotes a “liberal” and “enlightened” mix of: Aristocracy (rule by law and order, like ideal traditional “benevolent” kingdoms that aren’t tyrannical), Timocracy (rule by honor and duty, like a “benevolent” military; Sparta as an example), Oligarchy (rule by wealth and market-based-ethics, like a free-trading capitalist state), and Democracy (rule by pure liberty and equality, like a free citizen). Combining the forms is meant to maximize the virtues of state, to necessarily restrain the vices of each form, and to avoid Anarchy (a lack of law and order) and Tyranny (rule by fear, like a despot). This Mixed form, this “Mixed-Republic”, is sometimes called a “Polity” (for example by Plato… in his Republic from which this theory comes from, and from which Cicero, Machiavelli, Locke, Madison, and more built upon). Classical terms aside, generally speaking, the term Republicanism denotes classically liberal values like a separation of powers, legal rights, federalism, voting rights, and other key liberties and rights tempered by the classically conservative values of tradition, hierarchy, and order. Here we can note, that since Plato, many “enlightened” philosophers from Aristotle, to Livy, to Cicero, to Machiavelli, to Montesquieu, to Locke, and Paine, and many successful real life Republics like those of Rome and Italy, have added to the theory of Republics directly or indirectly through their writings or mere existence. That, along with Plato’s core theory, is what defines Republics (the entities) and Republicanism (the philosophy of Republicans). In other words, Republic/Republicanism describes both a real form of government and a realist/idealist political philosophy at the heart of classical liberalism (although it does not denote the exact “mix” used). With all the above in mind, we can say: Republicanism is a classically liberal ideology, that implies an aristocratic “mean between” liberal and conservative virtues, within the bounds of a mixed-form popular government, based on just laws. This is why Thomas Jefferson called his party, the Democratic-Republicans, Hamilton called his Federalists, and today we call some Americans “liberals”. It is because we are all Republicans, Democrats, Federalists, and Liberals, and all that is denoted by the term Republican (with the other terms just augmenting that primary crowned-jewel of a term that expresses it all, Republic). Below we discuss Republics and Republicanism in general and in America and its many different (yet valid) historical uses. First, let’s discuss what it means that the U.S. is a Republic (as this will illustrate what a good mixed-Republic looks like). “Real liberty is neither found in despotism or the extremes of democracy, but in moderate governments.” – Alexander Hamilton (Implying that utilizing a centered mix of government styles, rooted in law, was the only way to ensure Liberty). TIP: A Republic is almost always rooted in aristocracy to some degree (even when this isn’t denoted). Thus, classically speaking, a Republican is generally going to hold a mix of Democratic, Oligarchical, and Timocratic values, all tempered by core Aristocratic values. Given this, the virtues of Aristocrats and the virtues of Republicans are nearly identical to some degree. Law and Order are the virtues of Republicans and Aristocrats, but a Republican might push for more Oligarchy and Democracy, where a true aristocrat might not. Learn more about the true classical meaning of aristocracy, or learn more about the attributes of government to better understand how these fit together. TIP: The idea of a Republic comes from Plato’s Republic, in his Republic Plato suggests a mixed in which each higher form restrains the lower forms to ensure against tyranny. This is essentially what the U.S. used as a model (along with the works of later thinkers like Aristotle, Machiavelli, Montesquieu, Locke, and Paine. The United States is a Republic with a Democratic Spirit (and Oligarchical and Timocratic “attributes of government” as well; a “Mixed-Republic” or just a “Republic”). Its purpose is to avoid Tyranny, and to ensure law and order, in a popular free-trading government. In very simple terms, the Bill of Rights and Constitution confirm an Aristocratic type of “Representative Democracy”, and our system in practice with its current laws confirm other Democratic, Oligarchical, and Timocratic aspects. In the Constitution, Senators and the President and Supreme Court Justices are meant to be appointed, and the powers are separated. This is an Aristocratic process, and these positions are Aristocratic. In the Bill of Rights, basic liberties and rights are established (in Democratic, Republican, and Liberal tradition). The amendments have made the system even more Democratic (like the 13th, 17th, and 19th). The executive, including the Military, has become more Timocratic over time as we went from the Militias of the Second to a Standing Army and many executive agencies (like the FBI and CIA). The Capitalist free-trading system of our [mostly] free-trading Republic, and some oddities like Citizens United, are Oligarchical. Most of these aspects have come about as a result of legal changes (consider the Federal Reserve), but certainly in the spirit of Adam Smith, we are purposefully oligarchical (in that we have capitalism and free-trade to some degree). Thus, in original spirit (the intentions of the founders), and in practice (the actions of the all politicians since), we truly have a mixed-Republic. A Republic, rooted in an Aristocracy, with a Representative Democracy, with Timocratic executive agencies, an Oligarchical capitalist system. We don’t have a Pure Direct Democracy, and certainly we don’t have a pure Monarchy/Aristocracy, but instead we have a Polity (a republic) meant to stand for liberal and conservative values, and to ensure enlightened law and order, against tyranny, corruption, and special interests. Learn more about why the Founders created a Republic. A lawful and orderly state (an appreciation of aristocracy, and timocracy). A democratic spirit in some form (san appreciation for the virtues of democracy with a healthy fear of anarchy and democracy in extremes). An appreciation of free trading popular governments (so some tolerance for oligarchy within the mix). A sovereign people whose will is represented by the state (why true Republics are democratic whether they use a representative democracy like a parliamentary republic does or like a Presidential Republic as the U.S. does, a direct democracy like old Athens, or a mix). Rule by Representatives (a favoring of an aristocracy to pure democracy). A desire to maximize the virtues of the state, like liberty, equality, honor, strength, wealth, and justice; balancing these forces via correct and wise governance and typically voter participation and liberal principles like free speech, free assembly, free press, etc. TIP: Both the founding Anti-Federalist Thomas Jefferson and the founding Federalist Alexander Hamilton considered themselves Republicans and Federalists, and Liberals, and Democrats, etc. Consider the Jeffersonian Democratic-Republicans in the “one-party” Era of Good Feelings. The United States is both republican and democratic; the parties of any era represent two different stances on this, not two polar opposite positions. As noted above, but to confirm, a Republic describes a popular government that utilizes aspects of the aristocracy to ensure justice and order, as that is the means by which the other virtues are maximized. Likewise, a Republican is one whose principles are reflected by the virtues of this type of state (so not a tyrant, monarchist, or anarchist generally speaking). A Republican is also typically “a liberal” and “a Democrat” to some extent, although Republican implies a set of slightly more conservative values (in the favoring of order, aristocracy, law, and authority to accomplish the ends rather than a focus on pure liberty and/or equality). The concept is complex, so keep reading for different perspectives. Below we explain Republics and Republicanism in historic detail. 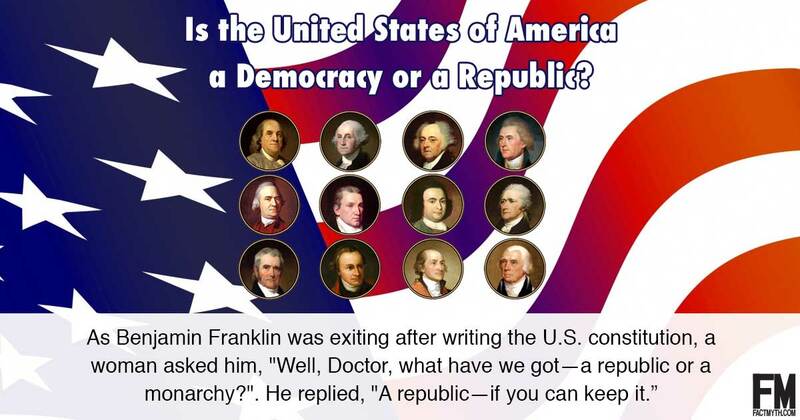 We compare Republics to classical forms of government like democracy and monarchy. Finally, we compare these concepts to the U.S. political parties. They relate to the original naming of the parties, and to a few aspects today, but typically one is wise not to conflate the U.S. parties and the core concepts they are named after. “We are now forming a republican government. Real liberty is neither found in despotism or the extremes of democracy, but in moderate governments.” – Alexander Hamilton. Republicanism, the one thing the founders from Jefferson, to Madison, to Hamilton, to Henry agreed on outside of liberalism. TIP: The term “Republic” is equatable with the Greek term Polity. Both terms can refer to “a state” or “a form of government,” but more specifically refer to “the ideal state” or “ideal form of government.” Polity and Republic are like containers in which different mixes of lawful popular governments can be placed in. The lawful form of government which is to “the right” of democracy is aristocracy, not “republic.” America is a mixed Republic with aspects of democracy and aristocracy working in tandem to create a lawful and correct balance. The above quote in context refers to Machiavelli’s idea that “there are only three forms of government” Monarchy, Aristocracy (Republic), and Democracy. However, Democracy is Anarchy, and thus not ever a form in practice (Machiavelli, a realist, considered Athenian Democracy, Roman Republican Democracy, and all other similar systems simply “republics”). Given the above, another acceptable definition for Republic is: Erring toward Aristocracy and away from Absolute Monarchy and Direct Pure Democracy. Definitions of what the term Republic means beyond the simple distinction between “a state for a sovereign people” (Republic) and “a state by a single absolute sovereign” (a Monarchy or “Principality”) are complex and have varied over time. From one perspective, a Republic is a synonym for the classical form of government aristocracy (ruled by the few). From another perspective, it isn’t a classical form at all, and is rather a container in which most of the classical forms can rest in either pure or mixed forms as long as there is the rule of law and the people are sovereign and without lawless anarchy, absolute monarchy, or pure despotism. In truth, the term has essentially been used in all these ways (by Plato, Aristotle, Livy, Machiavelli, Montesquieu, Locke, Rousseau, etc.) since it was first coined in Plato’s Republic. The first thing we should do to understand the nuances of “Republics” and the corresponding ideology “Republicanism” is to look back to the classical forms of government as laid out by the Greeks. TIP: The American political parties are named “Democratic” and “Republican.” You cannot equate the modern platforms and ideologies with the general terms Democracy and Republic used as absolutes. There is lots of room for interesting conversation here, but the U.S. party platforms have changed, ideologies differ issue-to-issue in each era, and the terms really shouldn’t be taken too literally in the modern day even when they seem to fit. See original meanings of the party names. The Republic, for which we stand, is a very Democratic Republic, and either party may be more Democratic or Republican on a given issue in any given era. Keeping in mind that the Greeks didn’t [always] draw little charts like the ones below to describe the governments. Below is an attempt to translate their theories into a few tables. See “the forms of government” for more discussion. NOTES: Plato and Aristotle don’t distinguish between Democracy and Anarchy. I think that was done to make a point. For Plato, Monarchy and Aristocracy may as well be the same thing even though he recognized that the “who rules” question applies and distinguishes between the two types before considering them together. Lastly, Plato’s Kallipolis (his ideal mixed government meant to rule over his “ideal Republic”) was a mix of Democracy, Oligarchy, and Aristocracy, so it doesn’t fit in the chart. NOTES: Aristotle, like Plato, treats Democracy and Anarchy as essentially the same thing. Here his Polity (his perfect mixed government) is placed in the many rulers box, as it shows that the seemingly great sounding Democracy isn’t as good in practice as it seems on paper. This should be taken to mean “the many shouldn’t rule.” They are sovereign, and they should be represented, but they shouldn’t rule directly. It is then, for the Greeks, this ideal mixed Republic that allows for the best system which best represents “the general will” of the people. Of course, this is just the type of thing that confuses people in modern times, making them think that “Democracy” is somehow inferior to “Republicanism.” It isn’t. As we will note below, our conversation today is “how should a mixed-Republic look?” Should it lean more toward aristocracy or more toward Plato’s Democracy? NOTES: Both Plato and Aristotle make our modern conversation a little confusing. They make it look somehow like Democracy was inherently bad as a concept. So, the modern chart above helps explain why we would want a “mixed Republic” rooted in an Aristocracy. It is a means to balance the forms and ensure the liberty and equality that Democracy sought in the first place. As you can see in the above charts, Democracy is a classical form of government, but technically speaking, “a Republic” isn’t. Republic describes any type of lawful state where the people are sovereign and have representation. Even a Constitutional Monarchy could be this in a sense, even though an absolute despotic Monarchy, where the people weren’t sovereign, or a tyrannical despotic state, which by its nature is not ruled lawfully, would not be. Thus, comparing a Republic to a Democracy isn’t the right starting point. Instead, we should start by discussing the difference between Pure Democracy and Aristocracy. A Pure Direct Democracy is a system of government in which everyone votes (sort of like Athenian Democracy), and Aristocracy is a system of government ruled by the few (whether elected, appointed, or hereditary; more like the Roman Republic). A Republic is a lawful popular government that almost always has aspects of both democracy and aristocracy in practice. However, when comparing “democracy and republics”, we treat the term “republic” like it is a synonym for an aristocracy. Thus, it is important to understand context when people are talking about Republican forms of governments. In modern terms, everything is talked about in the context of Republics (as all modern western states are Republics), so that can be a bit confusing. Again, the key is context. As if the above wasn’t confusing enough, the fact that Democrats and Republicans are named after these concepts adds more complexity. The problem is that their names speak to their founding ideologies to some extent, but are not attached to their modern ideologies nearly as accurately. When people talk about “Democracy and the United States Republic,” or “Democrats and Republicans,” they are usually referring to a more Aristocratic government vs. a more Democratic government, within the sphere of a liberal Republic. They talk about erring toward Democratic ideals vs. erring toward a more Aristocratic form of Republicanism. For now, let’s just conclude by saying, “a Republic” is a state like Machiavelli describes in which there is law, representatives, and the people are sovereign. When we say “republic” vs. “democracy” we could be talking about 1. republicanism as a concept vs. democratic ideals; 2. or, the form of government democracy vs. the form of government aristocracy. So, Again: What is Republicanism? Erring toward aristocracy and away from Monarchy and Democracy; and championing the principles of Republics (as noted above). Republicanism, not allowing for majority rule like its more Democratic cousin, on paper avoids some of the perils of the less restrained and more unordered Democracy. In Plato’s Republic, he showed how democracy became tyranny, and showed that only a mixed government, aristocracy, or monarchy could prevent it. A Very Basic Definition of Republic In cases where no other descriptors are offered, Republic generally implies a lawful form of government with both an aristocratic and democratic spirit (a love of equality, liberty, law, and order in balance). A Republic in this sense is just a lawful state with some form of popular government. Republic as a Synonym for a Lawful State In Plato’s Republic, the Republic is his Polity (his ideal mixed government). Thus, in this respect, the term Republic describes as a state in which a mix of the classical forms of governments is placed to create an ideal lawful popular government. In those terms, Republic can be seen as lawful container in which “mixes” of lawful government types are put. For example, the U.S. is a Democratically minded liberal Constitutional Federalist Elective Republic. TIP: It is vital to note that the term “Republic” has been used in different ways by different philosophers and real life governments. Machiavelli, Montesquieu, Locke, and Rousseau all discuss Republics. In all cases they denote popular lawful governments that aren’t pure Monarchies, but beyond that, definitions differ. Philosophy aside, Republics are real organizations that we can look at. See CIA World Factbook of Government Types. With that in mind, one should be forewarned that governments often give themselves names that don’t align with their governing style. The Democratic People’s Republic of North Korea comes to mind as an example of honorable name self-given to a despotic militaristic state. Today a modern conservative might twist this to imply that states’ rights is Republican value, and it is to some extent as Jefferson knew. However, in terms of the history of the parties, the solid south conservatives and the more liberal Jeffersonians were both Democrats. So, the argument works, but it is historically nonsense. The modern Republican party still retains a federalist ideology in some ways, but states’ rights was an anti-federalist position (Jeffersonian and states’ rights Confederate). The Federalist founders like Hamilton were essentially neoliberals. So today, when Democrats use federal power, it is federalist, it is more Republican than Democrat. The parties are fluid and change, so all Americans are both Democrats and Republicans. Whoever errs toward democracy on any issue is being a democrat and whomever errs toward Republicanism on any issue is being a Republican. The United States is a Constitutional Federal Republic (a federation of states with a Representative Democracy). At one point, during the Era of Good Feelings, there was only one party, the Democratic-Republicans (not an accidental name). All of this speaks to one simple fact, America is a Polity, a Kallipolis, and a “Mixed Government.” A mash-up of all the forms, with a separation of powers, each checking and balancing each other. A purposeful “mixed Republic” based on Montesquieu, Locke, Plato and other thinkers. You’ll notice the forms of government are hard to even place in a chart, consider that each form has many forms, and consider the history of philosophy and the political parties. We are a mixed government, and technically speaking, a republic isn’t a form of government. So, any attempt to over-simplify this or make it political (for example, by pretending all good qualities belong to the modern “Republican” Party) just confuses the reality of things. We are a Polity, both Democratic and Aristocratic by design, and our state, with its constitution, laws, sovereign states, sovereign people, and government, ruled by the few representatives, elected by the people for some positions, appointed in others, IS ONE OF MANY TYPES OF REPUBLICS. The tyranny of the minority party: In America we call ourselves Democrats and Republicans, and that make sense as we mostly are (just like the founders). However, the party platforms have changed, ideologies differ issue-to-issue, and thus the terms shouldn’t be taken too literally in the modern day. See original meanings of the party names. Today I hear people try to make a case for Republicanism as though it was designed by the Good Lord to protect rural less-populous states, but that is a misreading of history. Although all Americans are technically Republicans, The Federalists of the North were the ones who became the original Republican party. The winner-take-all system, the one that favors rural states in America, was invented by populist Democrats in the South as a mechanism for protecting their liberty (including their liberty to keep slaves), not by the Federalist future-Republicans who wanted a strong central government like England’s (a more aristocratic and less democratic government). The Federalists didn’t want elections for senators and the President, today we have them. If anything, it is more Republican to err towards an aristocracy, and the North and Cities of any era have always been “more Republican” in this respect (on most issues). I really respect the article: REPUBLIC vs. DEMOCRACY… but it presenting this very confusing and false view that Republicanism is somehow related to the modern Republican party and their states’ rights stance. That is historically inaccurate. Yes, a Republic can protect minority interests, but in the case of the old Democrats, they didn’t want “the few” “aristocrats” telling them what to do, and actually the Era of Good Feelings ended because the aristocracy picked Adams instead of picking the winner of the Popular vote Jackson. I can’t fit the full argument here, but let us just say, the modern party names shouldn’t be conflated with the ideology of the parties (things are way more complex than that). TIP: To add to the above point. The article republic vs. democracy says, “A republic and a democracy are identical in every aspect except one. In a republic the sovereignty is in each individual person. In a democracy the sovereignty is in the group.” This answer sounds good, and is true as a general statement in some respects, but it is provably incorrect as an absolute. The article seems to be about minority rights, but in that conversation, states’ rights are more democratic than federal power… yet federal power was used to end slavery and squash the states’ rights argument of the Confederate Democrats in the Civil War. For this reason and more, we can’t really boil this down to such simple terms. Sure, any American ideology sounds good, and wonderful if we can equate it with our own ideology, but correctness isn’t found in a single party, form of government or term, the whole reason this page is complex is because “mixed systems” that represent “the general will” (not the minority or majority will) are the ideal. TIP: Plato defined the terms clearly in his Republic, but since then differing philosophers and politicos have used the terms loosely to imply different things in different eras. So, there is no one definition, just “the classical definitions” and then all else that follows. TIP: One might think that pure democracy is best, as in that system all have total liberty and equality and all have a say in government… but that pure democratic system turns to anarchy (theoretically) as everyone getting a say on all things leads to not only a tyranny of the majority, but a certain degree of lawlessness and a lack of order. A person isn’t “in their perfect state” acting on their whims with no restraints, and neither is a nation. We may want more liberty and equality, but those ideals are ensured by a Republic. Thus, being a Republican is all about erring away from absolute monarchy, away from total liberty and equality, but toward a workable middle in which liberty and equality are maximized. On a give issue, we may find Democrats or Republicans taking this position, more typically though we find both arguing over minutia in the middle within the sphere of existing within a “Democratic Republic”. America is a Republic. If you think back to the Pledge of Allegiance, founding fathers, and core documents this becomes clear. We have a Republic- if you can keep it. Plato was Aristotle’s teacher, not the reverse. I fully agree, that was a mistype. Good catch! Way too confusing for the average Citizen, why the United States is where it is and falling fast. Well, it may be that this article goes overboard in trying to explain the many layers of the concept of republics and republicanism. If that is the case, perhaps I can create a simpler page at some point, or perhaps someone will take what I’ve written and convey it in simpler terms. Just doing the best I can here to discuss and convey core ideas. As for the U.S. falling fast? By what metric? The U.S. is the pinnacle of civilization in many respects, room to improve in others. There is no perfect republic, just the ideal of a more perfect one. Like Plato and the cave, you aim to get a closer look at the sun, you don’t actually reach it (that was the mistake Icarus made; That is, getting too close to the sun with be prepared).